Description of "Trading Mentors: Learn Timeless Strategies And Best Practices From Successful Traders"
Take A Sneak Peek Into The World Of Trading! Are you a new trader looking to learn essential trading knowledge so that you can start your journey towards profitable trading on the right footing? Or have you been trading for a while now but are still struggling because you don't know who you can trust to learn your trading skills from? In the world of trading, it is vital that you learn from the pioneers who are already playing at the top level of this competitive arena. How can you become a profitable independent trader regardless of your knowledge and experience level? This book serves as a positive first step for embarking on your journey toward trading proficiency on a strong foundation. After working hard and accumulating some savings, you contemplate whether to allow your bank deposits to be devalued by inflation--or you can find a way to trade your way to financial freedom. 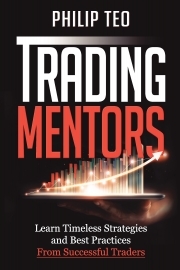 If you decide to take control of your financial destiny, the ten trading mentors profiled in this book will help shorten your learning curve to profitability by guiding you through their own trading styles and revealing their strategies to you. Trading Mentors is one of the few books on the market that introduces you to the experiences of 10 successful independent traders who have dug through the trenches and emerged on the other side. Each of them explains their unique trading methodologies and best practices so that you can implement what fits you the best and grow into the ultimate trader you can possibly become. Say yes to a new challenge and upgrade your trading game today! PHILIP TEO is the founder of Traderwave.com, a Singapore-based trading education and software company. He is also a partner trading coach with SGX Academy where he regularly conducts free trading seminars to the public. Previously, Philip served as the Chief Technical Analyst for OCBC Investment Research for 7 years, where he offered his trading advisory service to the bank’s trading, premium and private clients. Philip is a strong advocate of personal financial literacy and firmly believes that financial freedom is a realistic goal for the regular people out there if they learn and apply the right financial knowledge in their life. Through the many seminars he has conducted in the past to tens of thousands of retail traders with more to come in the years ahead, Philip aims to educate as many people as he can, the trading methodologies and best practices to become proficient and profitable traders in their own rights. Reviews of "Trading Mentors: Learn Timeless Strategies And Best Practices From Successful Traders"